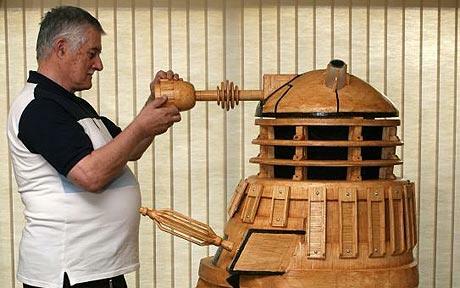 Created out of 480,000 matchsticks... Brian Croucher, 66, spent about two hours a day for more than two years to finish this amazing Dalek! The Daleks are so tragic and fascinating on Doctor Who. A creature who's entire existence was born out of racism and war. Imagine something designed to kill that which is different and not able to have any feelings. They wiped out all of the original races on their planet before embarking on a galactic purging of everything different. They also bring up the concept of regret and would it be worth it to commit genocide if the race being eradicated would later spread war and death across the galaxy. If you really want to get into the Daleks watch Doctor Who - Genesis of the Daleks, buy it here, it's an owner.